German motorcycle courier in Russia, 1942. 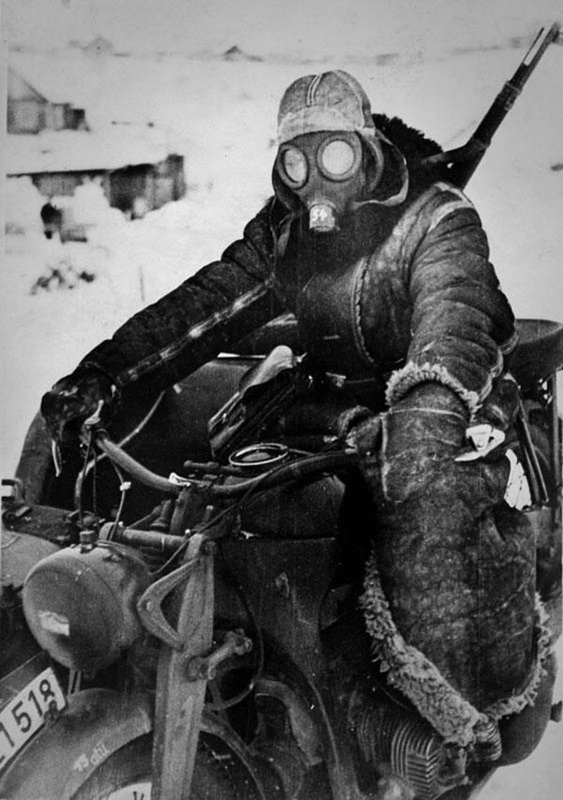 Riding on an exposed vehicle in the Russian Winter, here a combination motorcycle, required protective clothing. This Kradfahrer wears a sentry’s fur-lined overcoat, heavy mittens, the fur-lined cap of the reversible winter suit, which is no doubt being worn beneath the overcoat, and a gas-mask for face protection. The air filter canister has been removed from the gas-mask 38. Special extra eyepiece lens were issued for cold weather to prevent fogging by creating an airspace between the two lens. The other enemy was the Russian weather. By autumn the roads had turned into nearly impassable bogs, the fields over which the motorcycles traveled turning in to “seas of jelly three feet more deep”. By winter, temperatures fell to -40 degrees Celsius, engine oil and exposed soldiers froze solid. Some German motorcycle riders benefited from special heating systems grafted onto their bikes, including foot and hand warmers. However, by war’s end, many if not most of the motorcycles, along with their riders, never returned home.